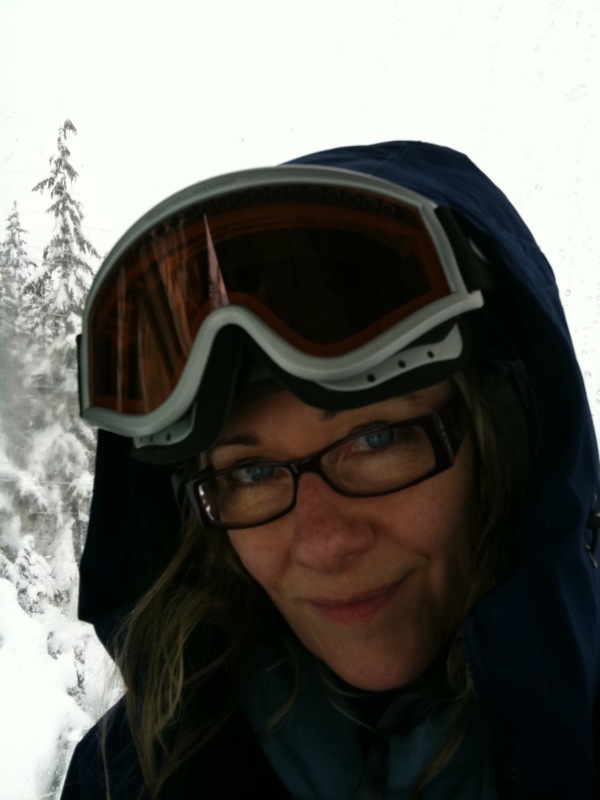 Get to know Leslie Cairns, Creative Director of Cairns Design Inc.
You are currently browsing the tag archive for the ‘Canada’ tag. I’ve been having a really hard time posting anything lately…. I’m always trying to keep it ‘light’ and ‘positive’, so when times are tough, I find myself with very little to say. Time to lay it all out there… to bare my soul, as they say, or as close as I can get to that. Last Christmas, my daughter and I kept a really low profile. We stayed home by ourselves. We went out for dinner one night and saw a movie with coupons someone had given us. We put up our tree and enjoyed our new little kitten, who entertained us by running up the centre of the tree, over and over again. As this year winds down, I’m asking myself, how the heck I ended up here… more broke than last Christmas, wondering how on earth I’m going to pay my rent. I feel like I worked every second last year and really didn’t have time to even stop to evaluate my finances. I just had to keep moving ahead with my goals with little time to stop and reflect on my personal situation. I’m just going to start by trying to remember all the things that I did accomplish or put into action. 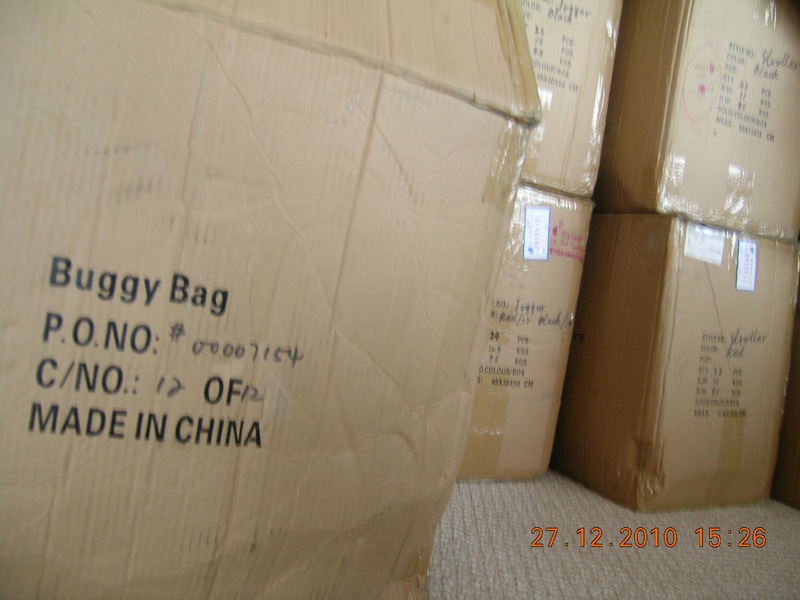 In the fall of 2009, I started working with Teresa, from Blacklake, who I’ve been working with ever since to establish quality manufacturing for a price that would make it possible to start selling Buggy Bag® at wholesale to retailers. The manufacturing costs here made the price untouchable at that level, so I was only able to sell the product one at a time, directly to end users… I wanted more people to be able to find it and use it. The year 2010 started out with work for the movie ‘A-Team‘, going to a local theatre to fix a velvet stage curtain, and the construction of some Fencing Jackets for the Arts Club Theatre. Much work with Rina from Liddleworks, and a photo shoot with the lovely Jessie Claveau for our new flyer which Rina designed. My generous friends took my daughter and I to Whistler for Easter weekend where I was able to prove to my self that I could still ski. That weekend was such fun! Went to the Dragon’s Den auditions and was told I didn’t have enough sales to move ahead. That was fine, and it was a benefit to me to work on the numbers etc. with Rina before hand. These exercises always shed light on the value of planning ahead and setting goals. My friend Wendy from PumpEase made it through the auditions, and onto the show which aired in October. I was contacted by LandMark Direct, who do TV commercials like the ‘As Seen On TV’ ads. I decided to have them make a 1 minute commercial for me that would run in 150 spots across the US. The purpose being to test the market to evaluate where advertising $ are best spent. I sent some samples of the Stroller, Jogger and Wheelchair weather blankets, and the process began. 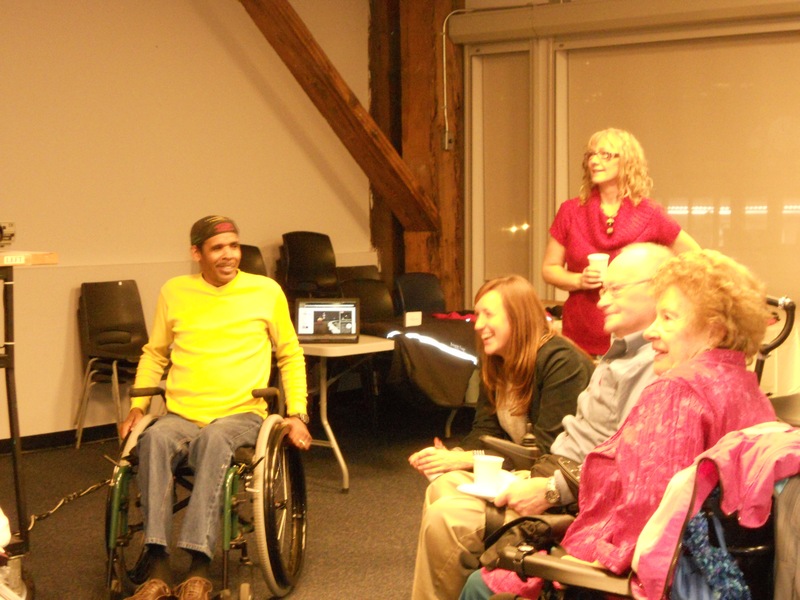 I met with the SCISN Board for the Rick Hansen Institute where I met with Gary McPherson about designing some custom wheelchair weather protection for him. I made a few sales there and met some lovely and inspiring people. It was through my work for former Vancouver mayer Sam Sullivan, that I ended up there. I had done a custom wheelchair poncho for him in the fall of 2009. I did a bit of work for a friend who had a contract to do some costumes for the Olympics. Then, an old school friend of mine moved back here from Singapore. She needed a place to land while she settled back into the Vancouver workplace and found a place to live. It was really nice having Kai here for that time and we had many fun times and good meals together. We went to many free Olympic festivities. It was really fun being in Vancouver at that time! 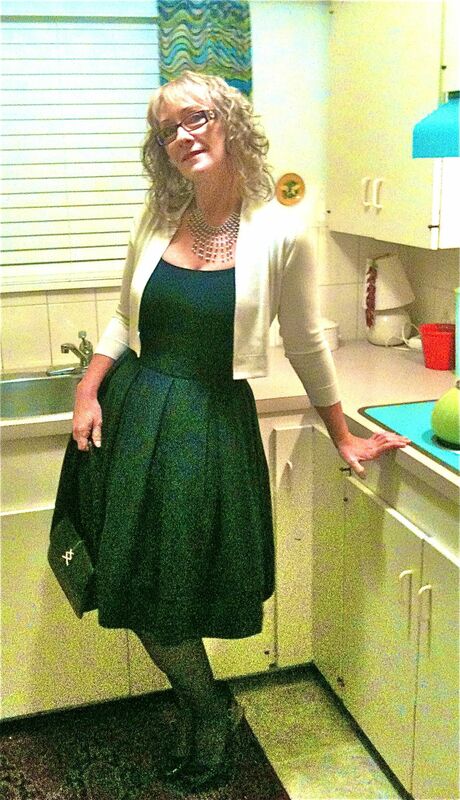 I shortened many, many sleeves for a TV show called ‘Human Target‘, did some pattern work for two local women’s wear designers, then I headed over to my friend Deb’s studio to help her with a bunch of gaberdine 50’s styles she was manufacturing for a TV show called ‘Fringe‘. I think I spent a few weeks over there. Nice to get out of my place… even though my place is like heaven, I still get lonely… I know I talked her ear off… I miss working with people. Found a US Patent and Trademark Lawyer and started to proceed with this process…$2500 later, I find out that even though, I have the trademark Buggy Bag Registered here in Canada and have owned the buggybag.com address since 1998, and I make and sell mobility accessories…. they feel that there will be some ‘confusion’ with the other company that makes shopping cart covers and uses my name only with an extra “g” on the end….I should have applied for the US TM back when this company first offered to buy my URL…. who knew they would just add another ‘g’ to the name. The patent is still in process… and the cost is unknown, but a fair guess would land it in the $10,000 range. Found out I need some very pricey licences to be able to sell a ‘stuffed’ article in Ontario, Quebec or Manitoba. One for each province and for each year at $500 each! Ouch, there goes my rent for that month. 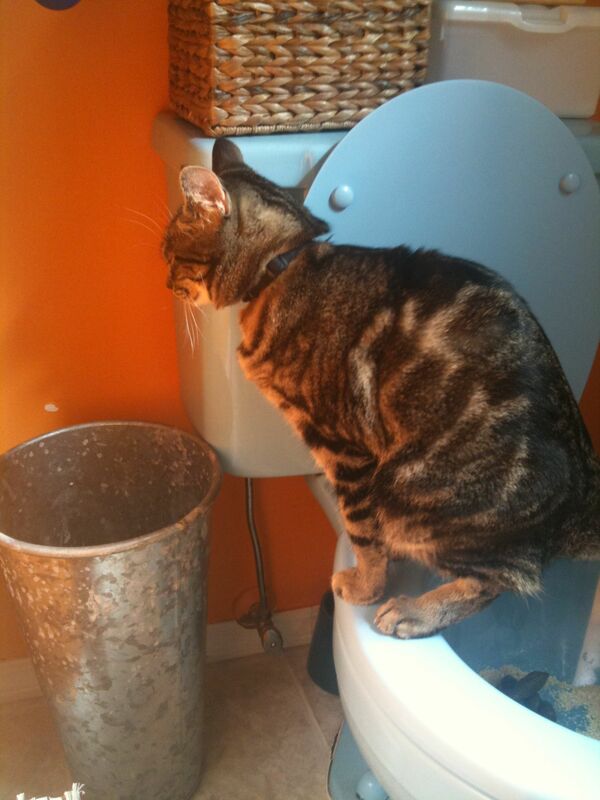 Next, I stumbled across a blog written by the mom of a beautiful little guy by the knick-name of Bugg. 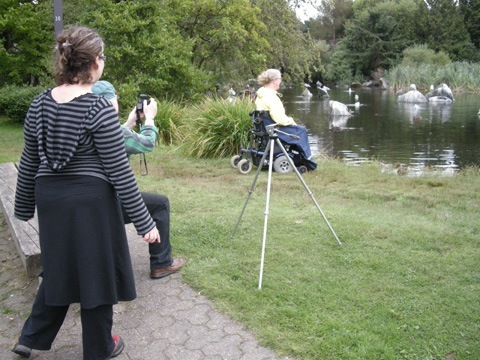 I was moved by her ability to document their life and the wonderful quality of her blog photos. http://thebuggslife.blogspot.com/ I sent this little guy a Buggy Bag Stroller Blanket to use on his tiny wheelchair. I was so happy to meet this family and help make Bugg’s outings a bit cozier. We still keep in touch and I hope to one day meet them in person. I then built some leather dresses for the character ‘Ginn’ on ‘Stragate Universe‘, and started working on another dog movie called ‘Treasure Buddies‘ featuring lots of cute children’s costumes, and also squeezed in an alteration of a down jacket for the movie ‘The Big Year‘, hemmed some shirts for ‘Ice Road Terror‘, and a bunch more custom work for ‘Stargate Universe’. 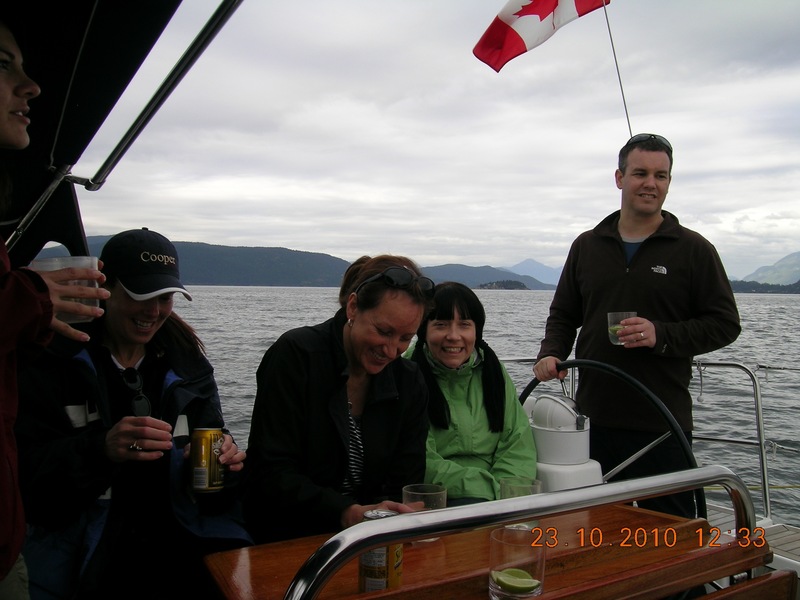 It was around this time that I met a great guy by the name of Brian Bell, the founder of Interfit in North Vancouver. Some friends and I went to their fundraiser, which I also blogged about. I made 9 pairs double layer fleece leg warmers for Sam Sullivan to give out to his associates, the moved onto yet more alterations for ‘The Big Year’, much more work for ‘Stargate Universe’ and the leather coat I made for ‘Sanctuary‘, which I also blogged about. It was right around this time that I got the sad news that Gary McPherson had passed away. More one on one work with Liddleworks… business plan. More work with Liddleworks… hangtag designs…. three tags with usage illustrations. Had a friend help with the french translations and found a hangtag manufacturer close to the factory in China. I made a dozen various aprons for ‘Red Riding Hood‘ before starting on the years fun show…. ‘The Fairly Odd Parents’ I always have fun working for Angus Strathie and this show was no exception! Many wonderful costumes for this show. More work on business plan…more $$$ I owe Liddleworks. Right after that I had the pleasure of meeting Jim Byrnes and making him a pair of trousers and an overcoat for ‘Sanctuary’. A man I spent two years trying to forget, suddenly appears in my life again, only to vanish again two months later. September finally rolled around, the commercial was ready to air, the production was in place and would be ready to ship at the end of Sept. I had to decide where to have the product shipped to, and decided that most of the sales would likely be from the US, so I found a ‘pick and pack’ place in Blaine. Volunteered at the World Wheelchair Rugby Championships. So fun, met lots of athletes and got to see some of the games. Commercial aired to no sales and therefore no stats… frustrating, but, must keep looking ahead. 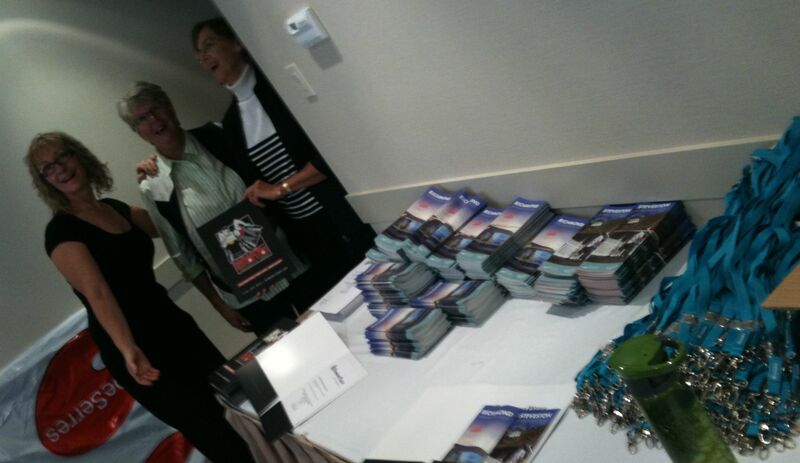 Landmark proposed an agreement to sell the product through catalogue sales. Lawyer read another contract…. $500. 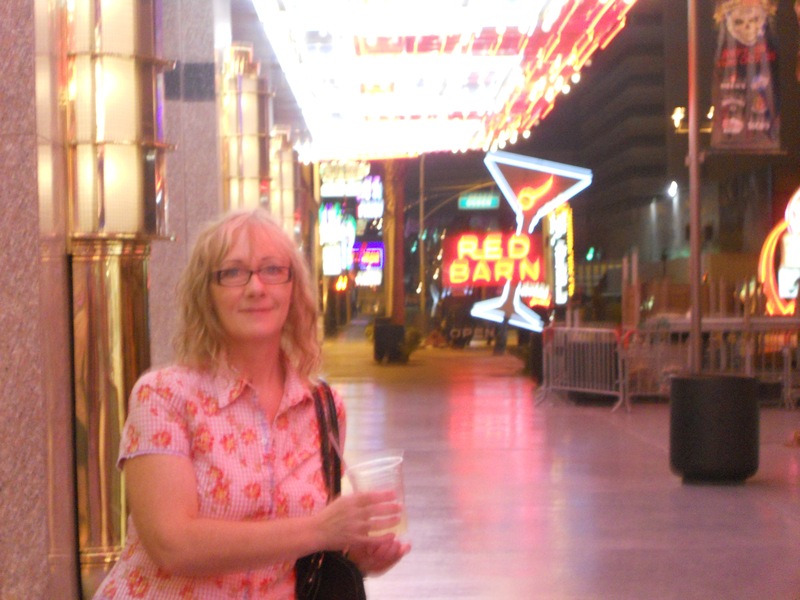 Chris, my brother and I head down to the ABC Kids show in Vegas to see what the competition is like, what to expect when we go to the show as a vendor, evaluate what kind of a booth we need, to look for sales reps and get a bit of R&R. We walked hundreds of miles that week and most of it was in the convention centre. We also, visited just about every hotel in the city, we won $76, and we had some fantastic meals. Launched new version of the Web Site that has been in the works for many months… it looks great and it’s only Phase I! Was immediately “de-friended” on facebook by the fellow that did the last version of the website. Went on a sailing trip to Molly’s Reach with some friends, which was another stellar weekend! Product is ready to ship, need to get financing… bank turned me down… evidently I should have bought an apartment instead of trying to make this great product available… at least that’s what they would have me believe! Landed the product in Canada and the US and took delivery the same day that we had our Buggy Bag reception for friends, customers and media…$550. Had a blast even though no media showed up, the important people were there. 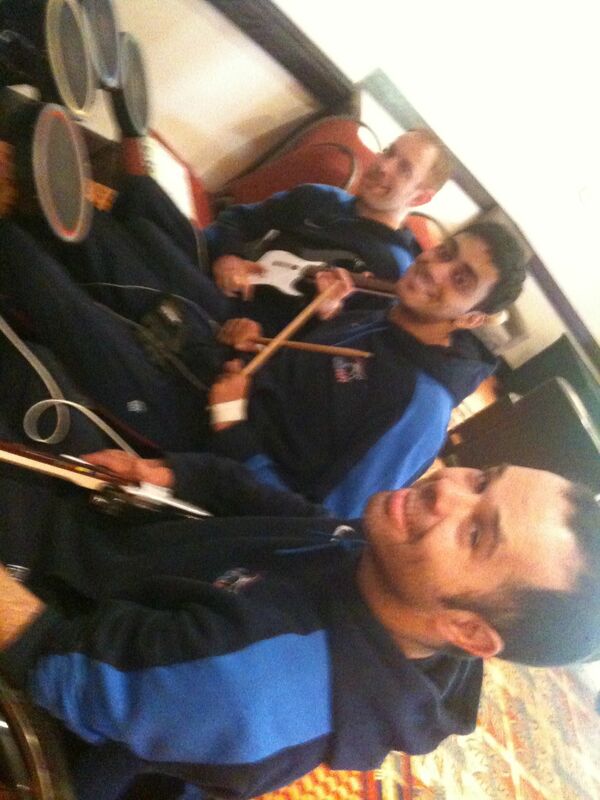 Including David Rountree, who I met when I volunteered at the World Wheelchair Rugby Championships back in September. He brought his ‘Floor-Board‘ for all of us to try. Sylvi MacCormac was a special musical guest at our event, who was also one of our models at the last shoot. We felt so honoured. Inspected the shipment that arrived here in my living room with Teresa from Blacklake. We realized there was a small QC issue with the shipment and had to look at our options…. do we send them back? I’m totally against that idea. I try a few different methods to deal with the issue and discover that I can solve it 100% with the use of my commercial iron. One of the perks of working in film is the ‘wrap party’ at the end of the show. 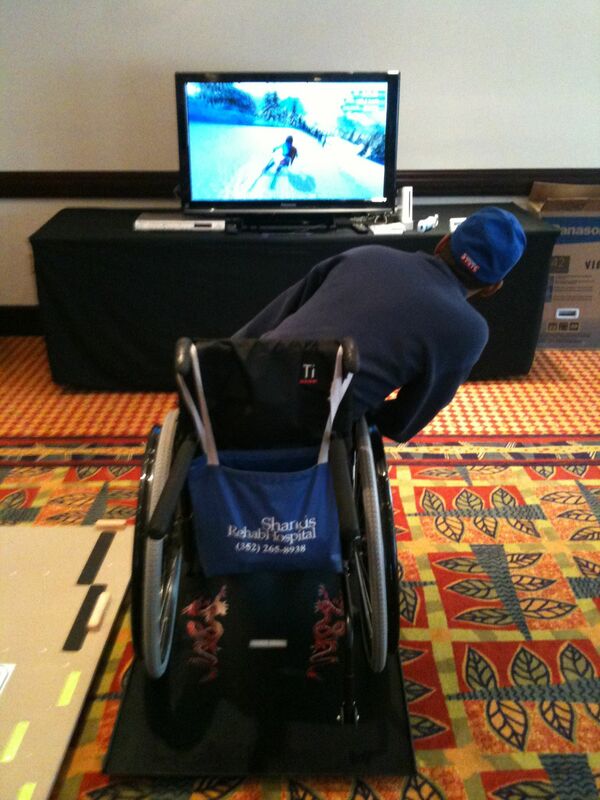 I went to 4 wrap parties and a gala benefit for Spinal Cord Injury. I wore the same outfit to 3 of them! Got an order for the stroller and jogger blanket from Babies’R’Us… a small trial order for the Canadian web site. Dear friend Barbara passed away, which left me in a blue funk for some time. Sadly missed. More work for the TV shows ‘Stargate Universe’ and ‘V‘. Teresa and I head down to the States to deal with the QC issue on that part of the shipment. One day and two very sore backs later and we are back in Vancouver, satisfied that the product is 100% perfect. December rolled around with no movie or tv work for me, so I started making phone calls. 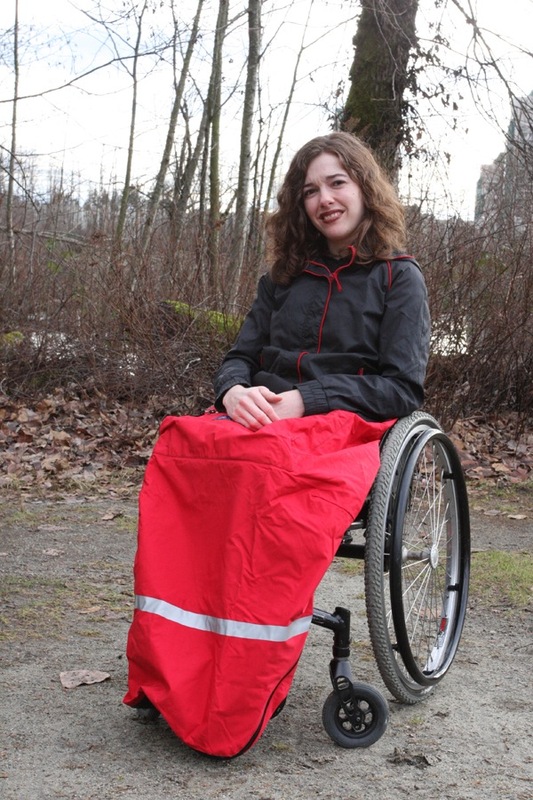 I always said I wasn’t a sales person, but, one call led to another and another and by mid December I had already shown the wheelchair weather blanket to at least 7 places and got it into 4 stores and 10 locations in the lower mainland. This is the easiest thing in the world to sell. It just makes sense because it’s easy to use and it helps people stay warm. I’ve been focusing on the wheelchair weather blanket, but, also got the jogger weather blanket into two stores as well. I read a blog that really touched me and I responded by sending a wheelchair lap blanket to the autor, Patrick, for his wife Patti. The response I got was worth every bit of the hard work I’ve done this year! I put 2 paid ads on Craig’s List one in Seattle area and one in NYC, looking for commissioned sales reps to rep the wheelchair weather blanket… $50. There may be a few potentials among the responses… I sure hope so. And it looks like I may have a rep in the Chicago area, who is a friend of Teresa’s…. Yeah! I sure hope that’s true… because my intention is to keep on keeping on, no matter what, because I believe that it is the right thing to do, and to continue to count my blessings. posted 171 times on the facebook fan page…. responded to 479 emails about the offshore production…. responded to 275 emails from Liddleworks…. spent 60 hours in dance classes…. 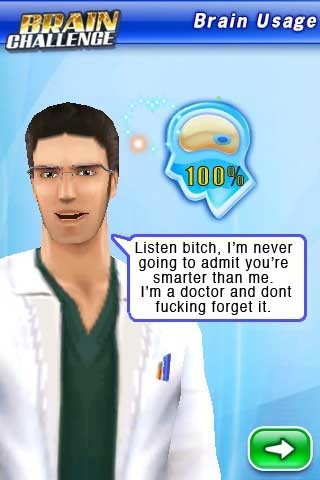 got to 99% on Brain Challenge…. hugged my daughter 730 times…. After reflecting on the past year, I know what my blessings are as clearly as I know everything is going to turn out great. I’m thankful for my daughter, my brother, my parents, my friends, my guides, my supporters, my vision, my health, my atitude, my customers, my humour, my suppliers, my teachers, my dance partners, my employers, my mentors and everyone who has crossed my path for whatever reason…..please know that every single one of you are responsible for at least two of the things I’m grateful for. I promised in my last post that I would let you know how I enjoyed the games. 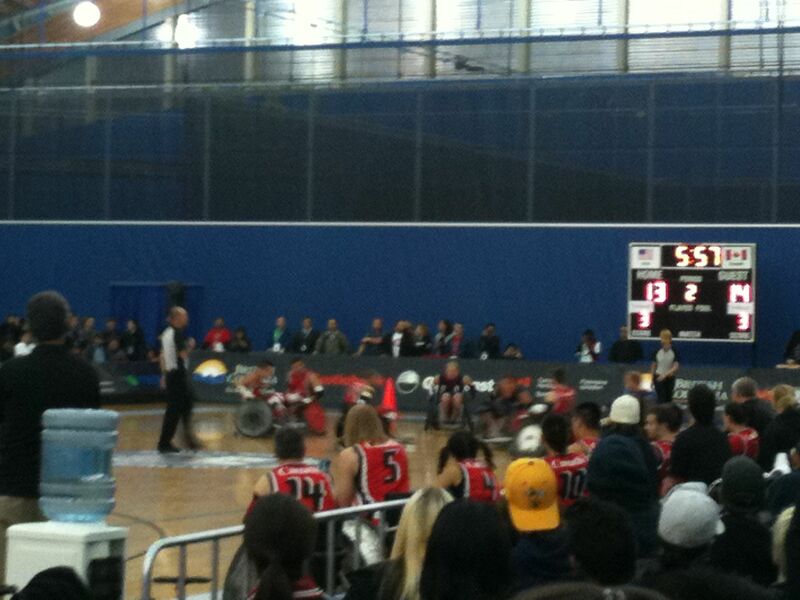 The first couple of Wheelchair Rugby games that I saw were while I was volunteering the day after my last post. I saw four games that day. There are two games being played simultaneously, so you can watch both at the same time. CAN v GBR, USA v GER, SWE v FIN and NSL v ARG, were the four games I got to see that day. All of the games were action packed and crazy and just a whole lot of fun to watch. It was fun volunteering. 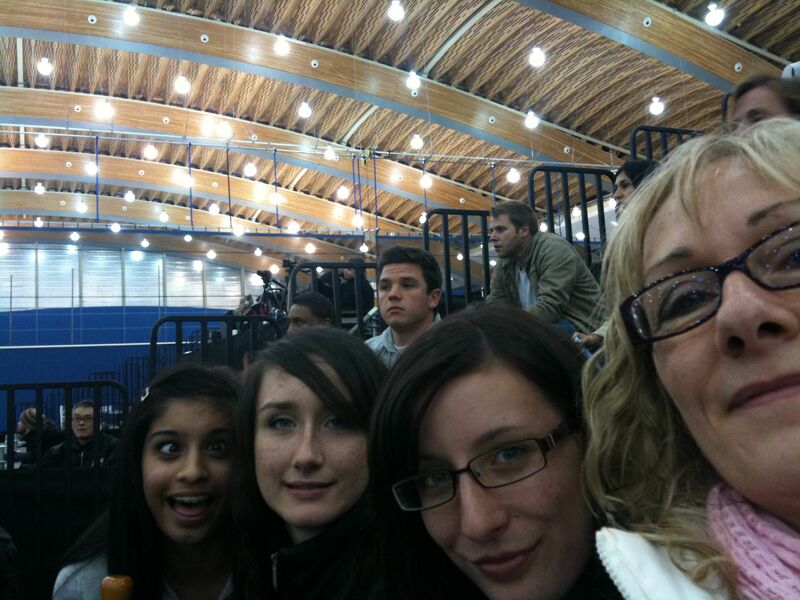 That day the stands were absolutely packed with schools from the lower mainland. A lot of the kids had made banners and were making lots of noise, so the air was vibrant surrounding those games. I enjoyed watching some of the guys I had met in the athletes lounge the day before, out there playing so hard. It was so much that I rushed back to the ticket desk and bought 4 tickets for Friday night. CAN v USA game. I took my daughter and 2 of her friends to the game. Girls night was off to a good start. The Richmond Oval is such a beautiful building… unfortunately, we were a bit late getting going and by the time we got there, all the seats were taken in front of the CAN v USA game. We were able to sit just between the two games closer to the side of the GER v FIN game. Canada and the US were 1 point apart throughout the entire game… it was super close for all 4 periods, with Canada leading. The girls enjoyed the games just as much as I did and between the four of us, I think we figured out the basic rules of the game. I felt a bit sorry for the Germany and Finland teams because everybody was watching the Canada v USA game and kind of ignoring their game…. that part didn’t feel right, but, I guess that’s par for the course when there are two games being played at the same time…. 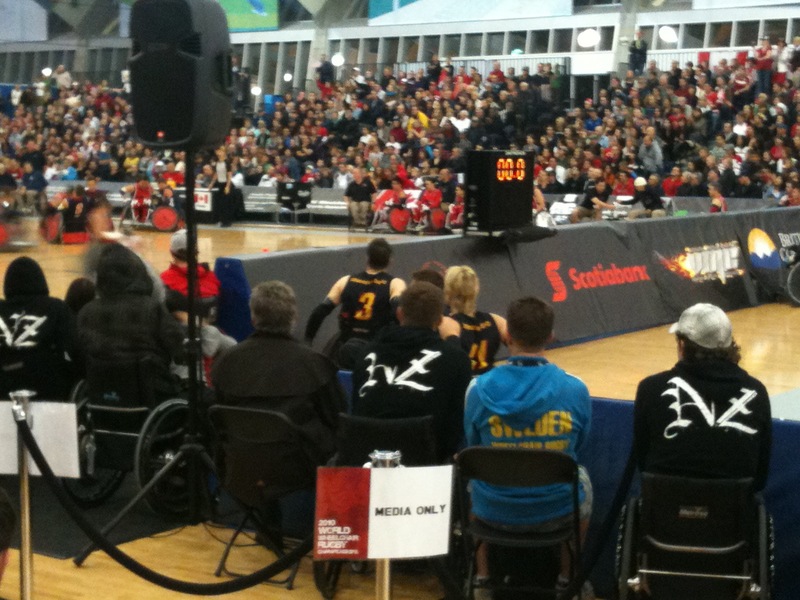 This shot shows the German team watching the Canada USA game along side with some of the other athletes. In the end USA overtook Canada and won by one point….and we headed home, all of us now, Murder Ball fans. 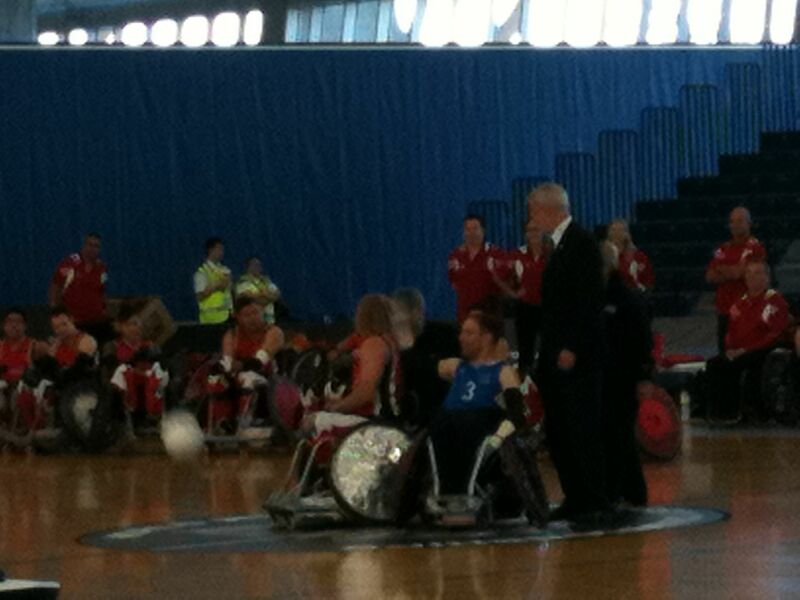 Push On… World Wheelchair Rugby Champs! 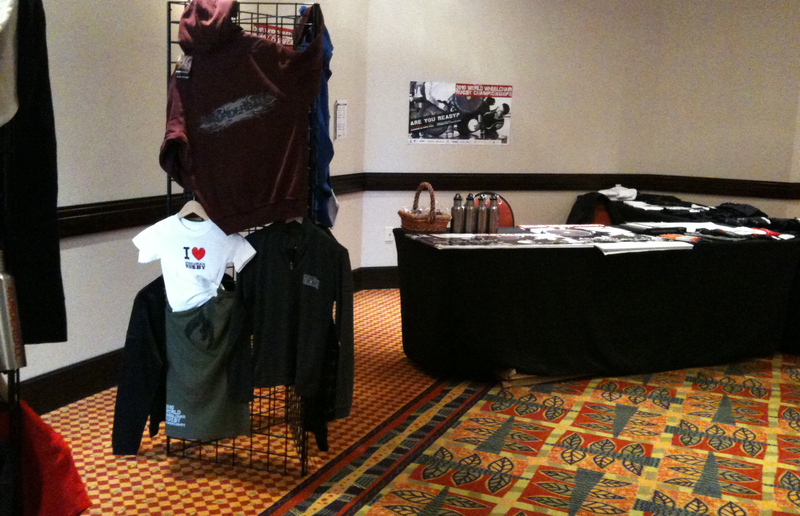 This morning started out at the Sheraton Hotel, with me merchandising some swag in the athletes lounge… that was fun. I was to keep the shirts, posters, pins, etc. in order and make sure that any visitors to the lounge had what they needed. I had lots of people come in to buy games shirts and I bought one of the delicious chocolates. 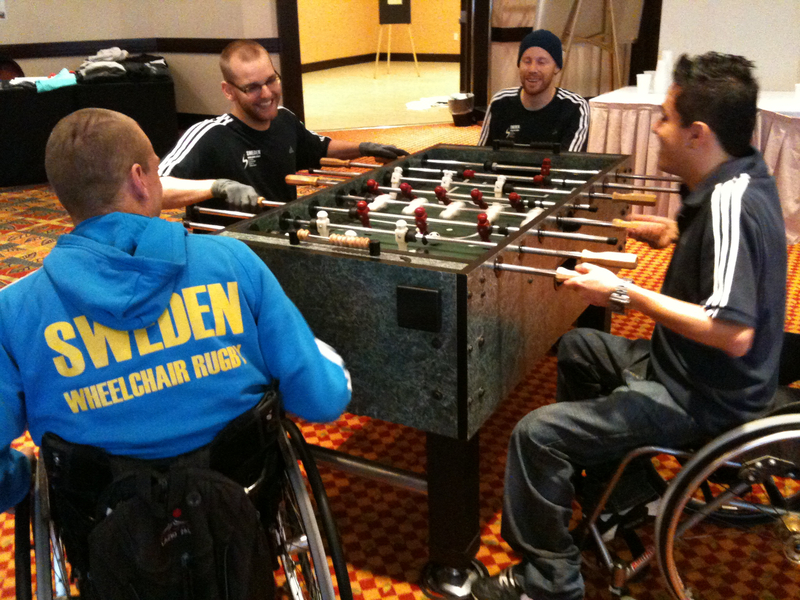 A few guys from team Sweden came in for a rousing game of foosball. 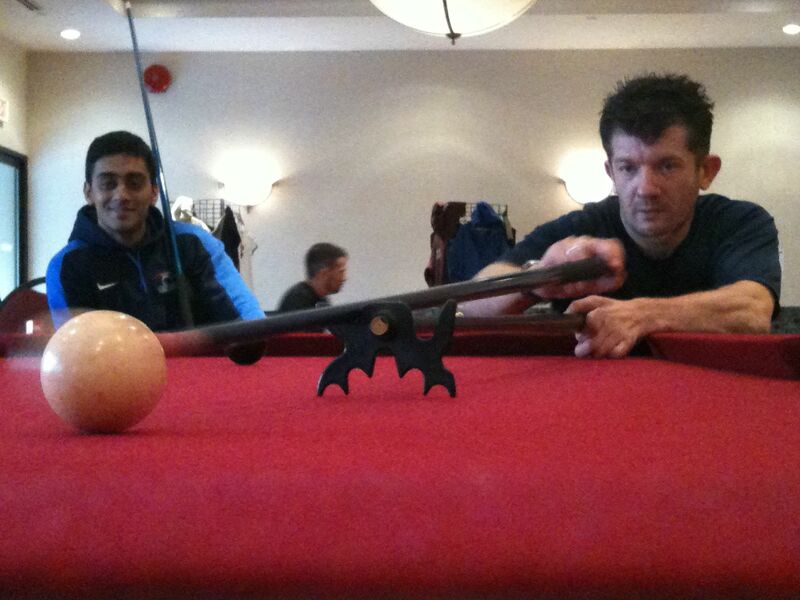 Manni and Ash shot a great game of pool, although it turned out that Ash was a bit of a “shark”… it was a fun game to watch. 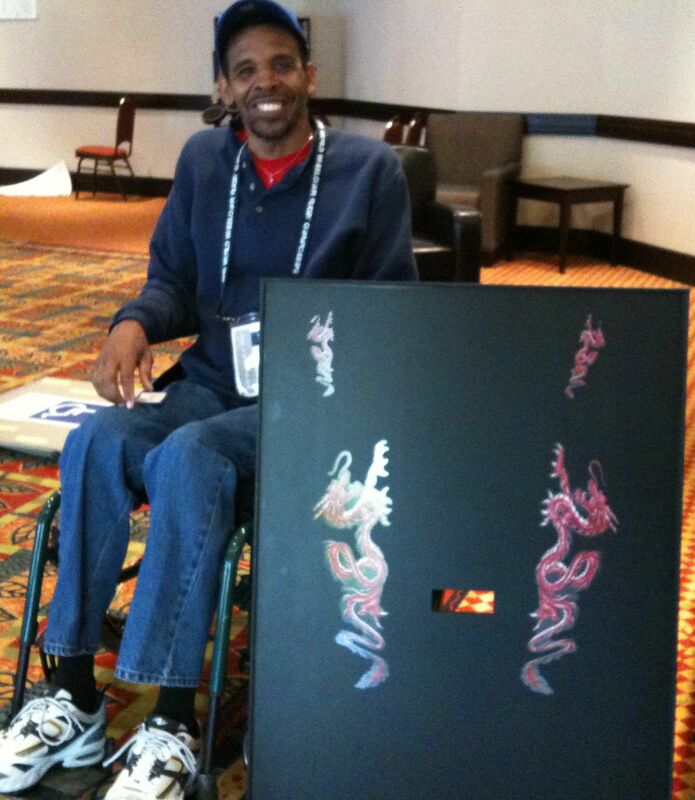 I met David Rountree, the inventor of the Floor-Board Wii Platform for wheelchairs. This is a really neat thing. The platform is designed to be seated right on top of the Wii Balance Board. 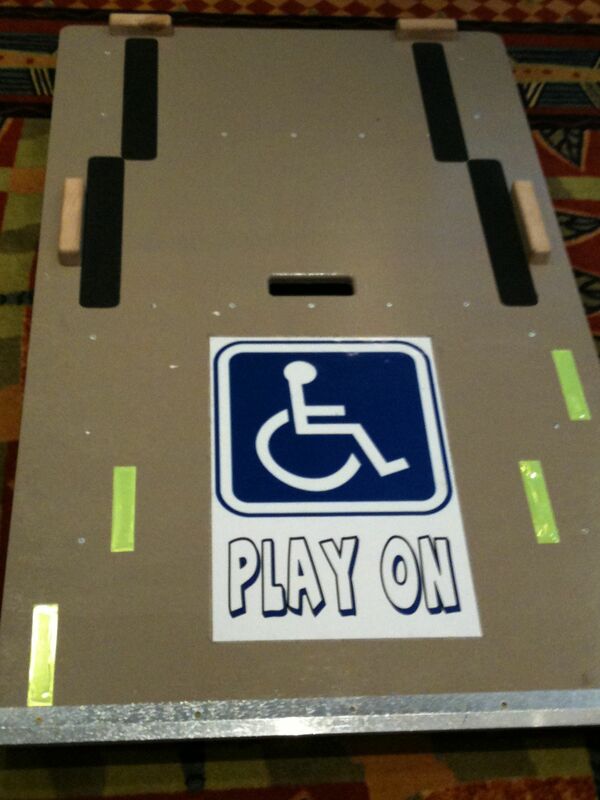 It tips/rocks down at the back as the wheelchair pushes onto it and then it even back out when the chair is perfectly balanced on the platform….Game On! David demonstrated to me how it worked and showed me how easy it is to slalom…yet later when I tried it myself, it proved to be much more difficult! Travis from Canada, Vancouver to be more precise, gave it a whirl too. From what David was saying, he’s just about to get the 3rd prototype back from the factory, each one better and lighter than it’s predecessor. I can understand what he’s going through, trying to get this great product out and into the hands of people that will use and love it. I feel like we have a lot in common when it comes to moving our products ahead…I have a lot of the same issues when it comes to buggy bag… it’s a long road, but, certainly an enjoyable journey. I had such a great day and met so many wonderful people… I can’t wait til tomorrow when I go and volunteer at the Richmond Oval. I’ve never been there before and hopefully I will get to glimpse a few minutes of these sold out games. These are the games that will be on when I’m there tomorrow…. there will be others, but, not while I’m there. 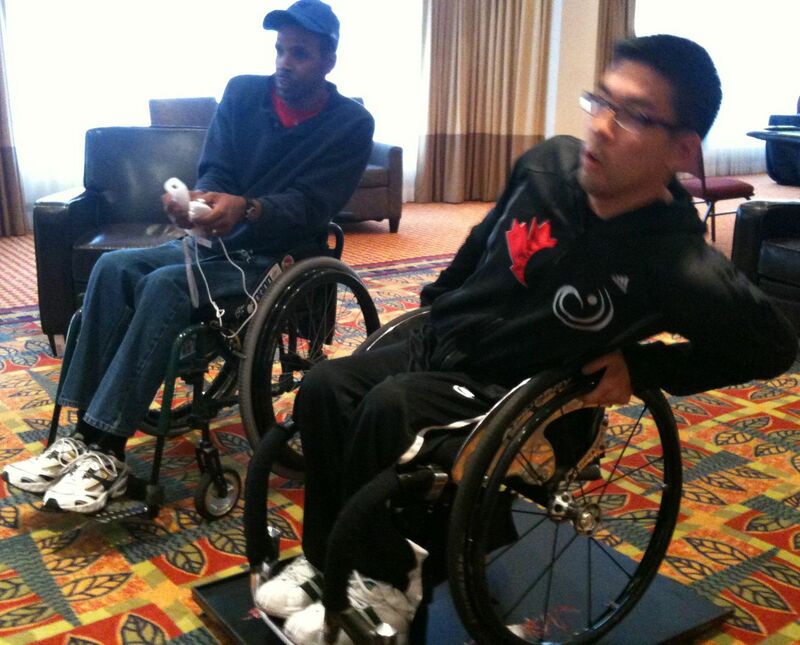 I’ve never seen the famous game of MurderBall played, but, I’m told it is very exciting…. anyway, I will let you know in my next post. I bought the tickets last May, as a gift for my daughters birthday. Last week I asked her if she wanted to take one of her friends to the show and she responded with, “no, you’re alright”. I guess I’ll take that as a compliment, although at the time it felt more like a mercy comment. The rain held off all day… right up until we got off the bus at Deer Lake Park. We made our way through the security with our two bags of rain gear and blankets and headed over to stake out our real estate on the grass. I immediately made a B-Line for the beer tent, grabbed a glass and came back to join Emma on the grass. The first band up was These Kids Wear Crowns from Chilliwack and it turns out the lead singer is my brothers friends nephew….haaaa…..kind of a funny coincidence. They were pretty good. We liked how they executed the cover tunes. I particularly like the way they covered the Beyonce single. A little bit of a punk edge to Single Ladies. They put lots of energy into their show. By the time the next act came on, we were both wearing our rain coats and were pretty much wet and my beer was slightly diluted. We wandered up and got a couple of crepes…yummmy and ran into two of Emmas friends and one their moms. I really enjoyed the second act. It was Daniel Wesley and I will be purchasing his album soon. I had heard of him, but was unfamiliar with his music. Turned out to be right up my alley. 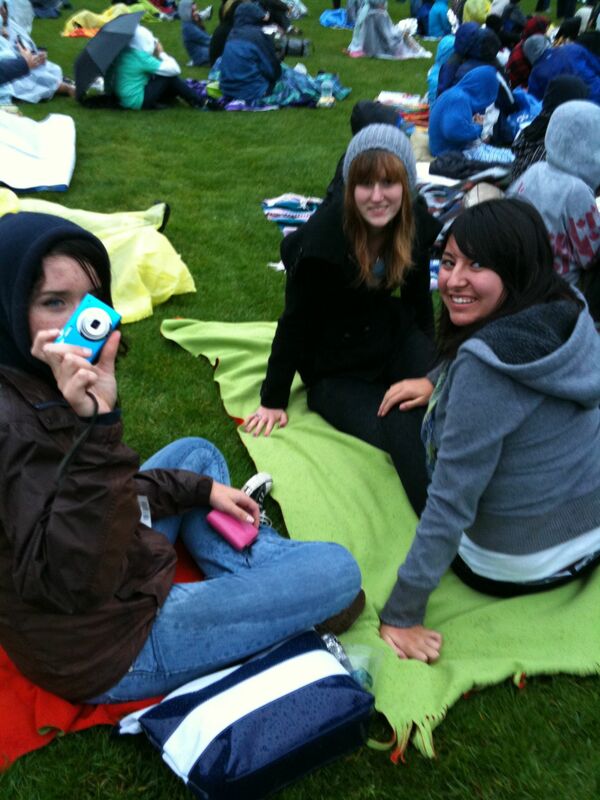 The main act, Hedley, came on and the girls all rushed down to the front area while Cathy and I stayed back and watched, enjoying the fresh coldness of the falling rain and our beers. 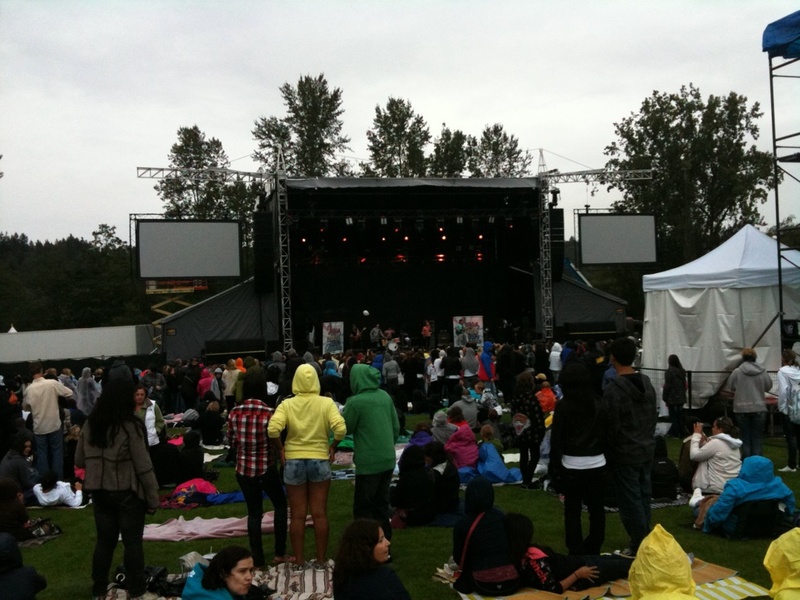 I have to admit that I really enjoyed Hedley and I was pleased to discover that they are from Vancouver. Indeed, all three bands were from the area, which was a really nice treat. Hedley, though, did seem truly Canadian, especially with the plaid shirt and the campfire! 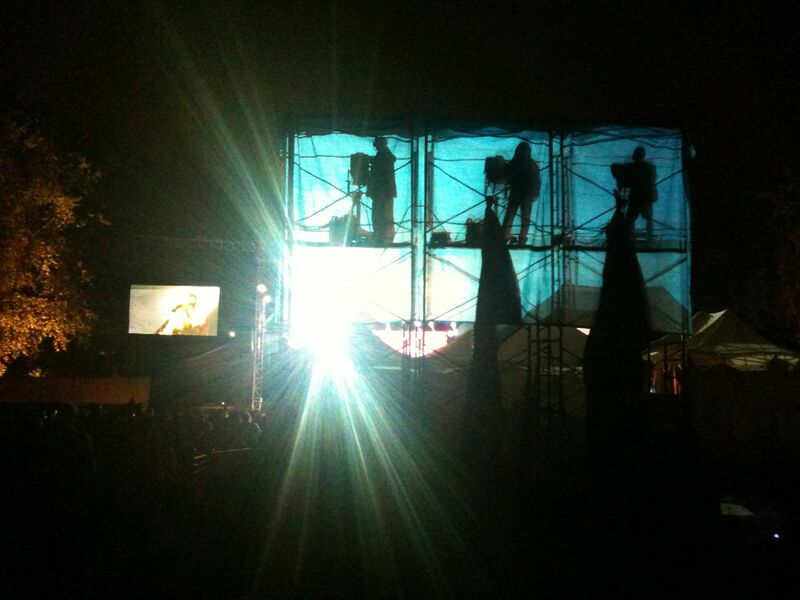 I love this shot of the back lit spotlight operators at work. We met up with the girls after the show and Emma and I said our goodbyes and jumped onto our bus home. When we transferred and ran to catch the next bus, Emma realized she had left her wallet on the previous bus. Luckily it was still in the bay and she was able to get it. We had to wait another half hour for the next bus which was a bit of a bummer, but, oh well….All in all it was a good night, good music, fun bus trips and good company, and we were at home and in bed by midnight. Buggy Bag® Mobility Products is dedicated to helping loved ones stay warm and dry while on the go. Buggy Bag® Stroller, Jogger and Wheelchair blankets protect against the cold and wet, while offering visibility in low light conditions.